CLICK HERE FOR THE LATEST STRIP! CLICK HERE FOR MORE SCARTOONS LIKE BEARMAN! Thank you for visiting the NEW, Improved, and Official BEARMAN Headquarters! It is, indeed, an honor and a privilege to introduce and present this comic strip to the world. Bearman was originally created during the summer of 1994. I was thirteen years old. Like many young teens, I had found myself the odd-man-out due to my unique attraction to drawing, and was adjusting to that awkward social transition from Grade School to Jr. High. I had always loved the collective works of Calvin & Hobbes, Garfield, Peanuts, and the like, so meanwhile, I had spent most of the school year buying and reading two remarkable, new comic strips: Mother Goose & Grimm by Mike Peters and Shoe by Jeff MacNelly. I was particularly drawn to the unique, yet complimentary styles in which these artists inked and rendered their work. The appeal of their drawings blew me away and my inspiration soared to an all-time high. As the end of the school year closed sluggishly in and finals drew near, I began sketching doodles of this dreary-eyed, hunchbacked bear and his smart-alacky animal friends. By the time I had designs and a look I was thrilled with, however, school let out for summer and the excitement was just powerful enough to force my new creation onto the back-burner...but not for long. Over the first week or so of summer vacation, I discovered that my taste in "fun" was beginning to differ from that of my friends. While we still enjoyed hanging out, my desire to create was stronger than ever and the more I tried to just pal around with my buds, the harder that desire tugged at my heart. I was genuinely torn! Finally, after an unforgettable conversation with my dad, Larry Raspberry (that handsome fellow in the upper lefthand corner of the page), I realized it was high time I listen to that creative voice and finish what I'd started. It was time to make something happen! Thank you, Dad. I'll never forget your advice! I spent that entire summer drawing the first collection of Bearman comic strips...the ENTIRE SUMMER!! From 8 or 9am to 7 or 8pm, I drew. Breaking only for meals, brainstorms, and restroom visits, I worked by the light of glorious mid-90's daytime TV. Schnookems & Meat, Lucy, Andy, Bob Barker, Vicki the robot, Baywatch, Scrooge, and the Tiny Toons kept me sane as I churned out page after page of rediculous, off-beat humor (that was probably only going to be funny to me.) I didn't care! By the end of summer, I had enough work to distribute copies to as many people as I wanted -- including Matt Groening at a Golden Apple Comics signing of Bart Simpson Issue #1. As always, Matt was very kind, humble, and generous, and he not only accepted my work, but sent me a letter of thanks and advice within a few months. That letter was one of the few staples of encouragement that kept me pushing toward my goal of becoming a professional cartoonist. Thank you, Matt! As fate and the Good Lord would have it, I journeyed on to secure a full-time gig at The Simpsons, and have since been able to share this story with Matt in person. So in a way, my little summer comic strip was the spark that started it all. To this day, I can't help but think back to that summer of 1994 and crack a tearful smile. I had pulled off the completion and major distribution of my first big project...what a feeling! Bearman was born. Now where were we? Ah yes, the beginning...always a fine place to start. Well as promised, the above is just one of many drawings from my care-free days as a wanna-be-cartoonist! This is what Bearman and his cohorts looked like in the earliest days of the comic strip...you know, before I really knew what I was doing. In fact, most of these are the first drawings I ever did of the characters (including Bearman himself), so before we go any further, I'd like to take a moment to explain the true purpose of this site. All young, aspiring cartoonists, artists, and students: This Bearman website is for YOU! Most, if not all, of the artwork on this page was created between 1994 and 1999. It is some of my earliest, rawest material, which I'm sure will become all too clear...if it isn't already! 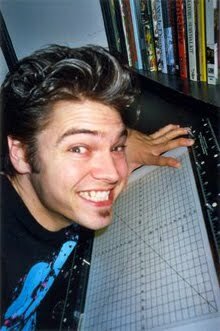 The reason I am sharing all of this with you now (over a decade later) is because I CAN! The internet is one of the most powerful resources the world has ever known, and certainly one of the most valuable to us artists. We can share anything online without having to worry about our work being altered or censored, and the exposure is not only worldwide...it's FREE! My point is that while I did create this website to share Bearman with the world, it's real purpose is to give you all a taste of what a professional's art looks like at first, and to encourage and inspire you to KEEP CREATING and take advantage of all the great resources, outlets, and ways we now have to share our creations with the globe. If nothing else, remember that everything you draw has value!! SAVE YOUR WORK...you just might want to share it someday! Now this look and design style for Bearman did not change until I revisited the comic in 1997, which brings me to Part II of our story. When we left off, I had just completed the original collection of strips and was feeling pretty darn satisfied! However, as is the case with any big project, a time of rest and reflection is always a nice way to wrap things up...unless it lasts for two or three years. Just as I was feeling fully refreshed, summer vacation ended and my last year of Jr. High began. From there, High School sucker-punched me in the face and before I knew it, I was too busy to even think about comics! My only saving grace was the Studio Arts class I attended during third period...all four years of my high school career. Our instructor, one Mr. Paul Hogan, was pretty laid back when it came to "doing your own thing," so about a year and a semester in, I began getting ideas for NEW Bearman strips. Combined with my new level of skill and ALL the great comics I was still reading in my spare time, I began revising the look and feel of the series. Bearman was BACK! 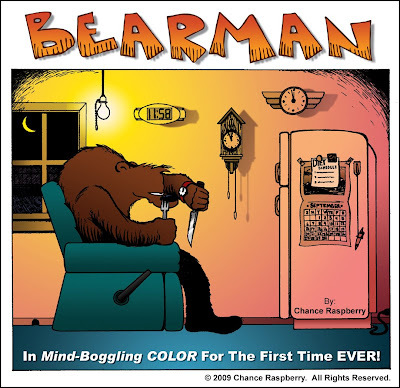 Over the next two years, I wrote and drew the second series of Bearman cartoons, which are being presented on this website in color for the very first time. These strips were originally created in black and white using mechanical graphite pencils and ink pens. The thought of applying color to the originals had never crossed my mind. Fortunately for me (and the originals), the strips remained line-art until years later when I was introduced to a handy-dandy little program called Photoshop! Over the course of 2005, I rendered the entire second series of Bearman in full color with the hopes of releasing a book. Though I didn't have nearly enough strips to complete a full volume, my mind was made up -- Bearman had to go public! The solution hit me like Freshman Year about 2008 or so -- why not create a website that opperates like the Sunday paper?! I could post one new comic strip each week and alternate between Series I and II. It would be just like having my cartoon professionally published in the L.A. Times, only this paper would be available to the whole world! I'm sure, of course, that this idea hit at least a million or so artists before it got to me, but hey...great minds think alike and a good idea is a good idea!! The reason it all came about, and you are here reading this today, is because of the inspiration and love of one man -- Curtis Jay Reiley. Curtis, or CJ as we like to call him (the fine-looking gentleman in the upper righthand corner, who's photo is 100% coincidental), was the uncle of one of my very best friends, not to mention Bearman's biggest fan. He always wanted to see the strip published and offered many words of wisdom and advice regarding how I might accomplish that. Whenever the opportunity arose, no matter what the situation, CJ would pose the question, "What would Bearman do?" About a year ago, CJ passed away, but along with some of the best memories, good times, and smiles of my life, he left me with the incomparable drive to see this project through to its end and deliver Bearman to the eyes of the world! It is with great pleasure and privilege that I dedicate this site in loving memory to Curtis Jay. Without him, Bearman may never have come this far! I sincerely hope these comic strips bring you as much joy as they have brought me, CJ, our familes, and our friends. Because of them and all of you, Bearman lives on! TM & © 1994-2015 Chance Raspberry. All Rights Reserved.